I had such a good time finding 10 Things to represent the 10 Perfections (which I wrote about here), that I decided to do something similar for the 7 Factors of Awakening. This time I chose things I could string. 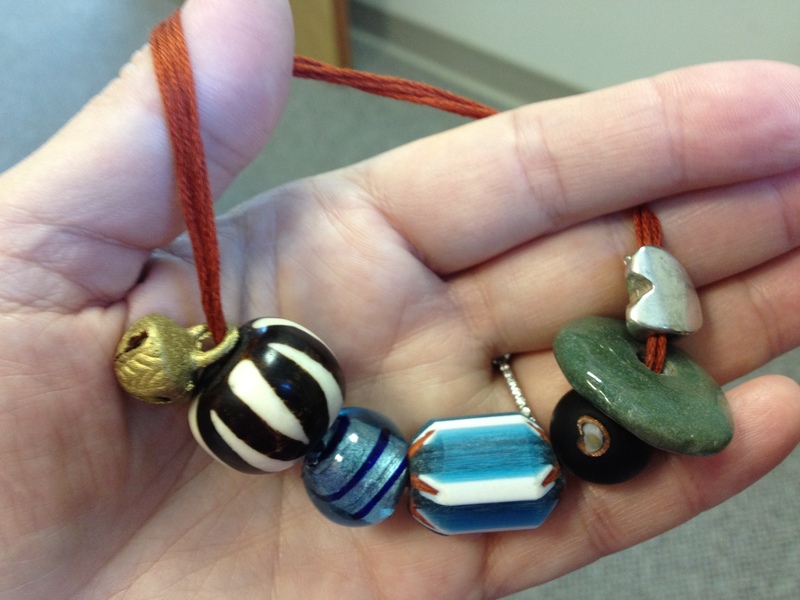 I started with a little brass bell for mindfulness (sati), then bone, glass and clay beads for investigation (dhamma-vicaya), energy (viriya), joy (piti), and tranquility (passaddhi), a polished jade circle for concentration (samadhi), and a little silver heart for equanimity (upekkha). I’m not sure what I’m going to do with them now. The string is a little too heavy to wear as a bracelet, but I like having it on my desk and picking it up every now and then. It makes a nice little jingling sound that I find…well….pleasant.